Gus and Ben are on the job, waiting and listening. Into the waiting silence rattles the dumb waiter with extraordinary demands for dishes they cannot supply – and who is operating the dumb waiter in an empty house? In a while their victim will come and they will know what to do. It?s a long time since I heard the sound of a dumb waiter, but thanks to Lauren Saunders? amazing sound effects at the Garrick?s Lauriston Studio, the memory returned. ?If you?re not in the know, this amazing mechanical devise carries food from a downstairs kitchen via a small lift, to the restaurant above. ?This contraption is central to the plot in Harold Pinter?s The Dumb waiter. ?It?s a 55 minute two hander featuring Bryn Thomas as Ben and Scott Ransome as Gus. ?They are hit men holed up in a dingy basement awaiting their next assignment. ?This slightly sinister play has lots of humour much of which relates to food after the two discover a food order when the dumb waiter unexpectedly crashes down. ?The tough leader of the two is Ben who is in with the boss, Wilson, from whom they await instructions and who we never see. ?Bryn Thomas?s character is a bully. ?It becomes clear that, like his unseen boss, he is a psychopath and Bryn?s character skilfully bursts into rages at the slightest provocation. ?In one terrifying scene he realistically attempts to strangle his junior partner simply because he says he will ?light the kettle? rather than the gas. ?The other guy, Gus, seems constantly bewildered enjoying the simple pleasure of Eccles cake and tea better than mayhem and murder. ?He is a walking dumb waiter himself as he bows to the demands of Ben. ?It is the relationship between the two that is so fascinating and so well portrayed by the two actors. ?The ending is a shock. It illustrates Pinter?s mastery of dramatic surprise. After the interval we see something very different. It is Edward Crosby Wells? Evensong. ?This is a gentle thesis on the relationship between a childless married couple who cling together long after romance has flown. 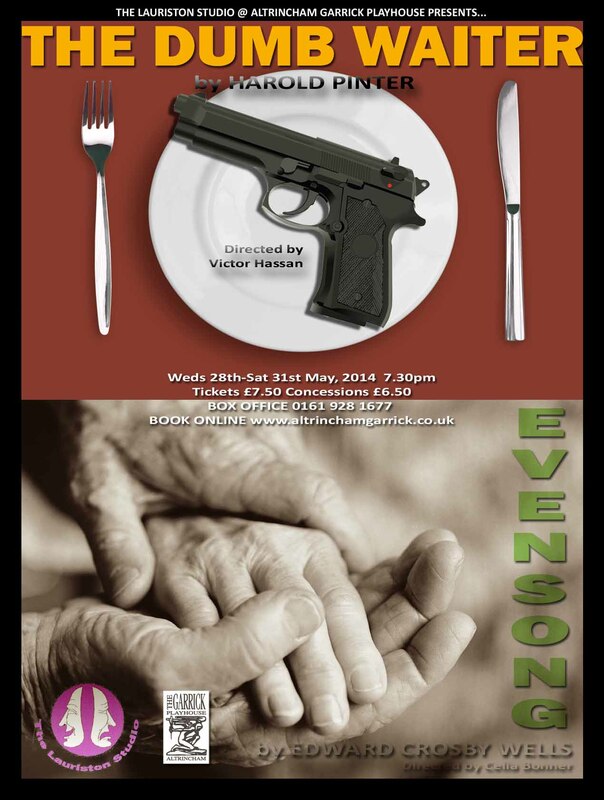 ?Steve Williamson and Carole Carr are masters of the emotion they create. You wonder if it is too late, on their 40th wedding anniversary, to save their marriage. ?Carole?s character is frantically attempting to write her memoirs and we gradually learn the reason why. ?Both have confessions to make and both have considered divorce. ?Yet, ultimately, they dance and you know the marriage will continue despite the obstacles strewn in its way. This is an enjoyable and thought-provoking evening.